UNITED KINGDOM: The controversial HS2 high-speed railway will take another step forward on Monday with the awarding of major construction contracts and the confirmation of the route north of Birmingham through Yorkshire. Contracts worth about £6.6bn and supporting 16,000 jobs will be announced for civil engineering projects in the first phase of HS2, between London and Birmingham, including tunnels and bridges along the line. The final route for the second phase, the Y-shaped network towards Manchester and Leeds, will also be confirmed, including changes to the original proposed route around Sheffield. Plans for a dedicated HS2 parkway station at a shopping centre were opposed by city councillors, and it is expected that the line will follow the M18, with a slow rail spur into the city centre – despite the objections of affected residents and local MPs including Ed Miliband. The transport secretary, Chris Grayling, will also publish a bill to prioritise phase 2a of HS2, building the line faster as far as Crewe. This could mean faster services joining further north on the west coast mainline by 2027, six years earlier than first envisaged, enabling quicker journeys to the north-west and Glasgow. Grayling said the award of contracts was “a hugely important step in the construction of Britain’s new railway, and underlines this government’s determination to deliver an economy that works for all”. Opponents of the high-speed rail scheme claimed the government was drastically underestimating the true cost, and that construction was already delayed. The overall budget was revised up to £55.7bn, but estimates drawn up earlier this year on behalf of Lord Berkeley, chairman of the Rail Freight Group, who had argued at select committees for alternative routes for HS2 out of London, suggested it could be as high as £111bn. Speaking on Monday, Grayling insisted the project was worth the money and would be delivered on time. “If we want high-quality infrastructure for the future were going to have to invest it, we’re going to have to spend money,” he told BBC Radio 4’s Today programme. Joe Rukin, Stop HS2 campaign manager, said: “The cost of HS2 has already doubled once since it was first proposed so it should come as no surprise to anyone that it might double again. 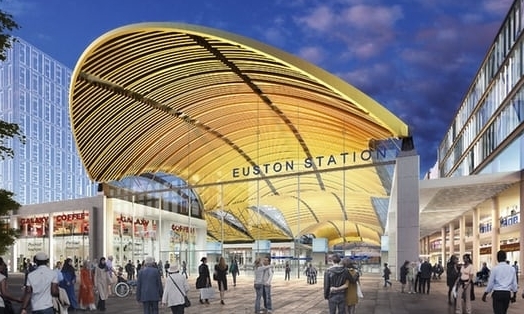 The first major preparatory works for HS2 are starting around Euston station this summer, including the closure of a public park and demolition of hundreds of homes on neighbouring estates, as local residents brace for up to a decade of disruption. High-speed trains from London to Birmingham are due to start running in 2026.